SIX YEARS AFTER the first generation Duster launched, the all-new Dacia Duster has reached these shores. Since its launch in 2012, over 10,000 models have been sold in Ireland. This second generation Duster gets new exterior styling and Dacia is saying that “not one body panel is carried over from the previous car.” The styling isn’t much different from the first generation model with the most noticeable changes being the ’rounded-square’ rear light clusters and the bonnet which is more sculpted than before. Inside, the instrument cluster is dominated by a digital display between the analogue dials and the infotainment system has been upgraded to a touchscreen display. From launch, the new Duster comes with a choice of one petrol and one diesel engine, both delivering 115hp. One is a 1.6-litre normally aspirated four-cylinder petrol unit, badged SCe, and the other is a 1.5-litre turbodiesel called the dCi. Both engines are paired with a manual gearbox. The diesel model will be available with 4×4 transmission from the start of 2019. In Ireland, there is the choice of three trim levels to choose from: Essential, Comfort and Prestige. Standard features across the range include LED daytime running lights, height-adjustable front headrests and seat belts, ECO mode and Stop and Start technology, gearshift indicator, engine immobiliser, automatic door lock, ABS and Emergency Brake Assist, ESC/ASR (Electronic Stability Control and Traction Control), new full-length curtain airbags and ISOFIX points in the rear. Essential trim models come with 16-inch steel wheels, prices from €17,390. Comfort trim models come with 16-inch ‘Cyclade’ alloy wheels, prices from €19,790. Prestige trim models come with brand new 17-inch ‘Diamond-cut’ alloy wheels, prices from €21,290. The all-new Dacia Duster is available now from dealers nationwide. Email “The all-new Dacia Duster has launched in Ireland”. 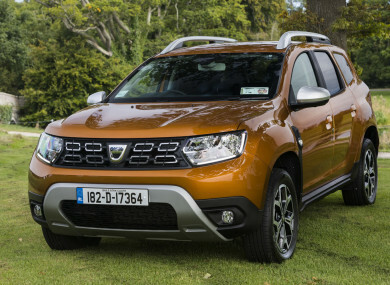 Feedback on “The all-new Dacia Duster has launched in Ireland”.